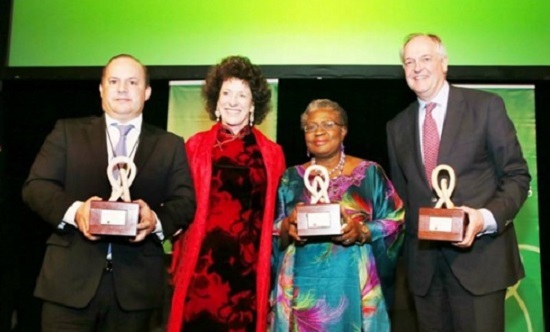 Nigeria’s Finance Minister and Coordinating Minister for the Economy Dr. Ngozi Okonjo-Iweala was on Tuesday in New York, USA honored with the prestigious David Rockefeller Bridging Leadership Award alongside Paul Polman, CEO of Unilever and Simao Jatene, governor of the State of Para, Brazil in New York. Okonjo-Iweala and the two others joined a list of high profile personalities such as the late Nelson Mandela, Kofi Anan, Bill Clinton, Sir Richard Branson, Her Majesty Queen Rania Al Abdullah of Jordan, Bill Gates, President of Liberia Ellen Johnson-Sirleaf, James Wolfenson etc, that have been honored in the past. The only other Nigerian who has previously received the award for her decades-long work of empowering women is Mrs. Bisi Fayemi. In Okonjo-Iweala’s case, she is being honoured for her uncommon courage and capacity to deliver on the economy and lead, in a very difficult environment. Organised as part of the Synergos Institute University for a Night Series, the event brings together leaders from business, government and civil society to discuss innovative ways of addressing global problems. Synergos is a group of leading philantropists that look at issues such as unleashing the leadership capacity of young people; changing the lives of women and girls; women’s health and social justice; improving governance to meet human needs; overcoming violence and sustaining peace. Founded in 1986 by Peggy Rockefeller Dulany who serves as Chair, the organization supports initiatives in more than 30 countries and regions. It has staff and representatives in Africa, Europe, Middle East and Latin America. The award was presented by Mrs. Dulany.